It's Sketch day over at Fab Friday! I had fun with this sketch! I have a super cute snowflake card coming soon so I wanted to switch it up! Instead of a snowflake I used the adorable wreath! 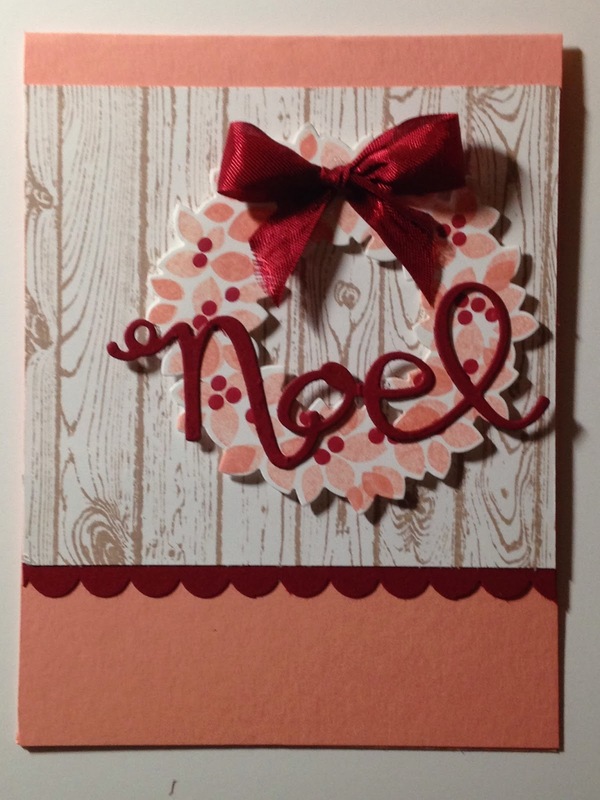 One of my new favorite combinations for Christmas this year is Cherry Cobbler, Crisp Cantaloupe and Whisper White (I did add some Crumb Cake ink with the Hardwood Background). My favorite part of the Wondrous Wreath Stamp Set is that you stamp three pieces. This may seem like no big deal but if you make a mistake (like I did), you can easily move things to cover it! Thanks for following Stampin' in the Sun! I hope you enjoy this card and come back to check out other projects I have coming up! I love these colors on the wreath! It's so festive but unexpected! Have a great weekend! TFS!